When I saw this sketch, I knew that I would break out my postage stamp stickers that I look at every once in a while, but have never used. They are 1.5" tall so I had to tweak all the measurements on both cards. I started this post with only one card...but I decided to go back and make a second (the butterflies). You see, originally I could not decide which set of stickers to use, so why not use both? Now I just need to wait for Mr Linky. Hi Linda! 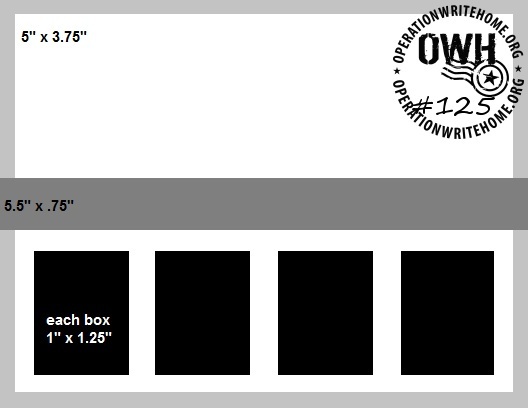 Theee postage stamp stickers are perfect for the new OWH sketch! Love both of your cards, especially those pretty butterflies against that DP! Great use of those stickers! This challenge seems to have pushed a lot of us into using some long-unloved supplies! NJ! This is a GREAT use of stickers! Those are just perfect for the sketch! The butterfly stickers are so beautiful. It always feels good to use up some of that stash! Great job. I couldn't believe these were stickers. They work so great for this sketch. Both of the cards are lovely. Love these! I like how you overlapped the horizontal piece with the butterflies. Great colors too. I love your cards. Perfect use for the stickers!